Over the years I’ve shared, or even introduced friends to lots of cultural style foods, including a bit of Asian fusion, like today’s Asian Style Grilled Tuna and Noodles dish. On occasion though, when it comes to recipe inquiries, upon hearing the ingredient list the sighs begin, followed by various versions on how it’s too much work to prepare. The thing is, some cuisines, including those Asian style, do involve separately prepping at least a few types of vegetables, each offering not only their own diverse range of health benefits, but adding a colorful palate to the arrangement. This being noted, as you get to know a little about the variety of condiments, or even spices, commonly used within a cuisine, you will observe that really, those same collection of ingredients are used again and again, even in producing various flavor combinations. For many Asian style dishes some ingredients may already even be part of your pantry, such as the sweet component, using sugar, brown sugar, or honey, and other flavoring agents, mustard, orange juice, or hot sauce. With Asian style grilled tuna, a marinade is prepared for the tuna, and then, its similar ingredients are simply brought together in a different way for the noodles, with both parts of the dish including garlic, ginger, soy sauce, hoisin sauce, sesame oil. Combining these ingredients is an easy mix. It really is that simple, giving us a theme for the day, ‘Don’t sigh, give it a try.’ Hope you like my little rhyme, and that you too will find, that it really doesn’t take so much time. 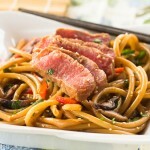 Recipe amounts for Tuna Steak Marinade and Noodles and Vegetables in Sauce serve 4-6. Leftover noodles may be briefly microwaved for warming the following day. Mix all ingredients for Tuna Steak marinade together in a long glass bowl, place in the tuna steaks, cover with a lid or plastic wrap and refrigerate for two hours or longer, turning once halfway through. Preheat grill fifteen minutes before grilling tuna steaks. Remove steaks from marinade brushing off any attached garlic and ginger. Place onto hot grill on medium heat and let cook for three minutes before angling the tuna to create grill marks, cook another two minutes, turn over, grilling tuna steaks for another 3-4 minutes, more or less, to desired doneness. Slice tuna on an angle and arrange on top of the hot noodles and vegetables in sauce. Stir all 'sauce' ingredients into a sauce pan, set aside. Cook carrots in boiling water for two minutes, drain, refresh in cold water, transfer to a large platter big enough to hold the cooked noodles and vegetables. On medium heat, add a tablespoon oil into a large nonstick pan, swirl about then tumble in the shiitake mushrooms shaking pan to avoid crowding, let cook for a few minutes, shake pan, cook another minute or two, sprinkle with salt, transfer to the platter with the carrots. Stir in the red pepper strips. Cook perciatelli pasta in salted boiling water until al dente, meanwhile heat the sauce mixture on very low heat until very hot. Drain pasta, immediately add the pasta to the vegetables in the platter, pour the hot sauce mixture over the pasta and vegetables, toss well then return the pasta with sauce to the large nonstick pan, heat on very low heat frequently tumbling the mixture about until the sauce thickens and combines into the noodles, stir through the chopped scallions, toss again, plate Noodle Dish topping with grilled sliced tuna. Garnish with sesame seeds and fresh chopped cilantro. Serve straight away. This entry was posted in Fish, Pasta- Rice-Grains and tagged Asian Noodles and vegetables in sauce, Asian Noodles and vegetables in sauce recipe, Asian Style Grilled Tuna and Noodles, Asian Style Grilled Tuna recipe, Grilled Tuna. Bookmark the permalink. Post a comment or leave a trackback: Trackback URL. I’m always looking for new ways to prepare tuna steaks. A citrus rub is my go-to, but in the colder months, Asian flavors seem warmer. Thanks for the great idea! Already pinned it for next time. Hi Kelly! I do hope you give this a try, it really is not so difficult, just a bit of prep and ingredient mixing! Delicious, and yes it is rather nice in the cooler weather too!Thank you for pinning. 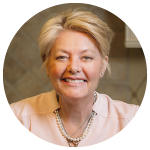 Dear Peggy I will not “sigh, but give it a try”, promised – yes, it is a fun rhyme and your recipe is a wonderful dish that you introduced to us. Love the flavors and the combination of fresh tuna and noodles – it does look like a picture perfect luch to me. And upon studying your recipe, I did realize that I actually do have most of the ingrediensts in my pantry – for example hoisin sauce is much liked in our house. Hi Andrea, Thank You. And so happy you are not sighing- but then you have such a talented and diverse repertoire that you most certainly could whip up this combination in no time. I bet the kids would love the noodles, my grandson does! I like hoisin sauce too, quite a versatile condiment in a wide range of Asian foods. It was a lovely Wednesday indeed at my Korean Cuisine class at Drexel Univ.where I also prepared Mung Bean Pancakes for the class, they were enjoyed all around. Happy to see you and talk to you soon! This sounds like a lovely recipe, and it’s true, I have most of the ingredients already in my pantry. My partner tends to get stuck on Thai curries at home, but I think that something like this (though with tofu for him) would be a nice change. Hi Teresa, thanks so much! 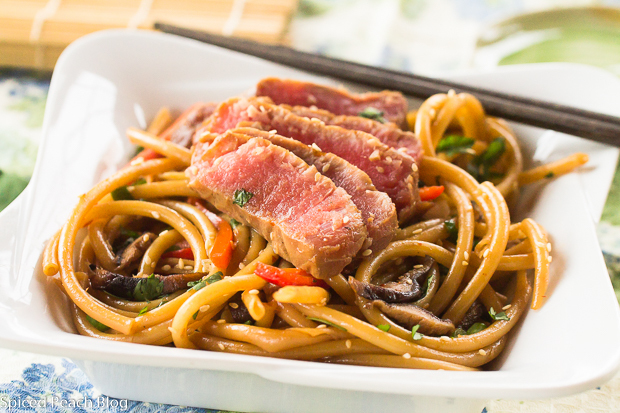 I love these noodles and combined with the Grilled Tuna, very delicious and a special treat.